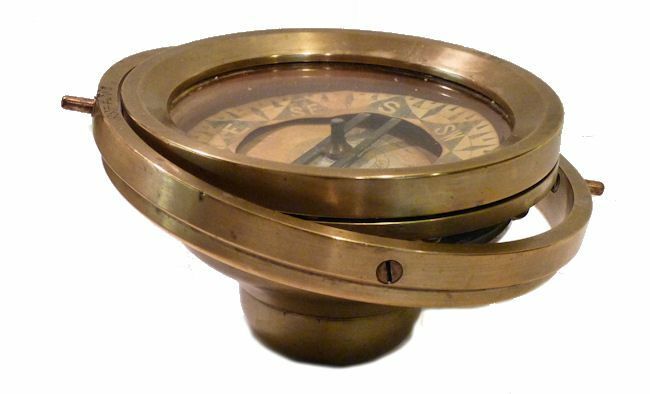 To view our current inventory of binnacles, compasses and steering sattions, click here! PRESENTED is a small size antique compass made by the American instrument maker, D. Baker of Boston. It's historic name makes it an interesting conversation piece in any setting. Originally, it would have been mounted in a box, or housed in a binnacle which may have been used in whalerboat, dory or fishing boat of the 1850's. 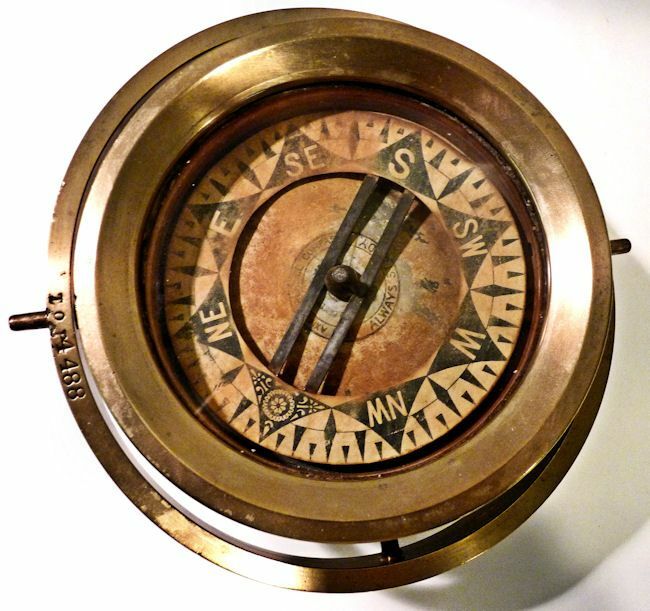 COMPASS' MAKER: Baker was born in New Bedford, MA in 1792. Baker is listed in Webster's and also in the Whaleman's list which shows he was a dealer in nautical instruments. Later, he worked with a partner, Thomas Hooper at 54 Ann St., in Boston, MA. THE COMPASS is an old paper card compass. It is solidly made and housed in a glazed, heavy brass case with weight at the bottom. The engraved paper card has an unusual geometric design as its North pointer over a circular cartouche. The card is divided into eight Cardinal Points, each of 45 degrees, and then into 1/8 and 1/16th points. Each point subtends an arc of 11 1/4 degrees comprising in total 360 degrees of the compass. 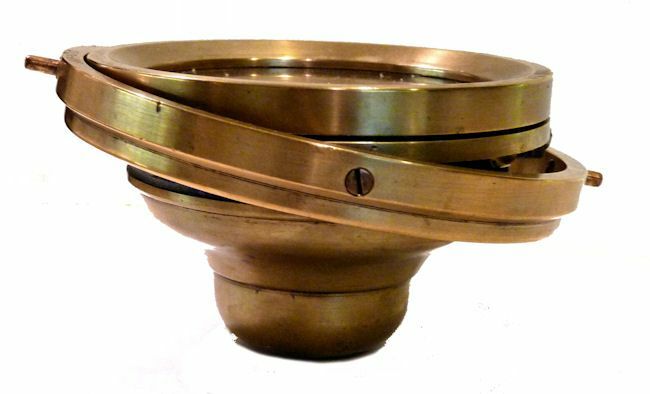 It rests on a brass pivot with a cap. The compass's card drags and is slow to register the heading because of its age, otherwise it is in fine condition. MARKINGS: The Axial Balance Compass - Always ready and on the gimball "TOP 4488" and on the compass in two places the same number. CONDITION: The compass card's paint is faded and has a light rusty appearance. At one time it was filled with liquid. There are the usual minor marks of age. The card sometimes drags due to a loss of magnitism over the years making it suitable for display. Otherwise it is is of high quality and made by a respected instrument maker.